Amaryllis are natives of South Africa and can be grown outdoors in tropical and subtropical areas. Amaryllis do not require much care and can be manipulated to bloom at various times of the year, although Christmas and Valentine’s Day are most popular. The beautiful, large trumpet-shaped flowers are born on 2-foot stalks and the blooms last from one to two weeks. Amaryllis colors include red, pink and salmon. There are also flowers with a different color edge from the bloom and bicolored blooms. Apply fertilizer once you start to see growth from the bulb. It is better to fertilize more often with a dilute fertilizer than to apply full strength all at once. However, follow the manufacturer’s directions on amount to use, as all fertilizer brands are different. Water the bulb and soil when the growth begins. Allow the top of the soil to dry out before watering again. The interval between watering will depend on the temperature and sunlight the plant is getting and the type of container it is in. Clay pots will allow the soil to dry out faster than plastic. Stake the amaryllis' flower stalk when it reaches 6 to 12 inches high. The weight of the large flower can break the stalk without support. Be careful not to stick the stake into the bulb. Move the amaryllis away from direct sunlight, once the flower start to bloom. Placing it in indirect light helps the flower last longer. 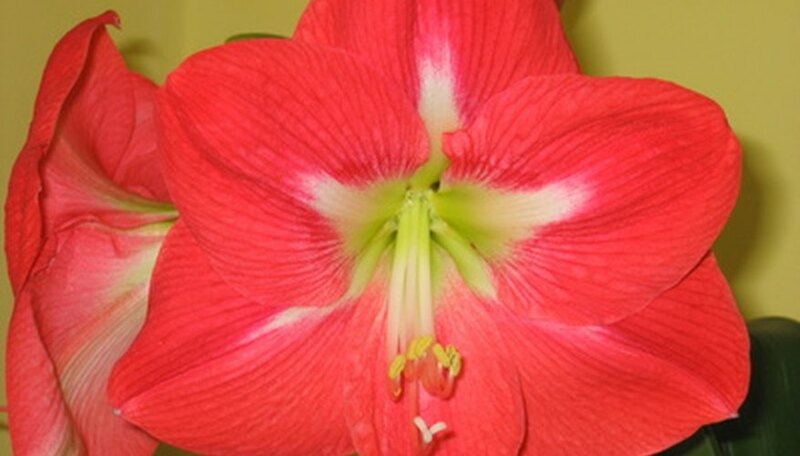 Remove the yellow stamens inside the bloom to keep the amaryllis in bloom longer. Cut the flowers off the stalk when they begin to fade. Leave the stalk and any foliage. Cut the stalk off when it completely yellows, but grow the foliage like any other houseplant for five to six months. Stop fertilizing the amaryllis and slowly decrease watering two to three months before you want the bulb to bloom again. This rest period is essential for new flower blooms. Keep it in a cool, dark area, between 50 and 60 degrees F for six to eight weeks. Counting the time starts once all the leaves are yellow. Bring the bulb back into a warm, sunny area after the rest period and water thoroughly. Do not water again until you start to see growth. Repeat the cycle again. Amaryllis like to be pot bound, so re-potting is not necessary for about three years. At that point, only re-pot in the next larger size pot.